An invitation shouldn't be put in anything but the best. 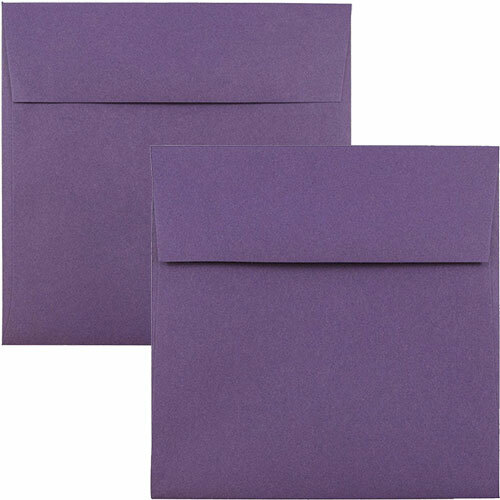 With these Purple Square Envelopes, the color along with the shape will create a beautiful and unique look that you really cannot find anywhere else. A square invitation has a certain quality that gives it a modern look, while purple gives a royal edge. With our many shades and many sizes, you'll be able to pin point which one you'd like easily. From a dark purple for a professional feel to a wisteria purple for a light, airy feel. We have a collection of translucent envelopes that will give your invitations an even greater unique factor by letting your recipient take a sneak peek even before opening it up! Purple Square Envelopes are available in 7 shades of purple: Dark Purple, Light Purple, Primary Blue Translucent, Wisteria Purple Translucent, Cromatica Indigo Translucent, Purple Translucent, Virtual Vision Lavender Translucent, Stardream Metallic Punch Purple.